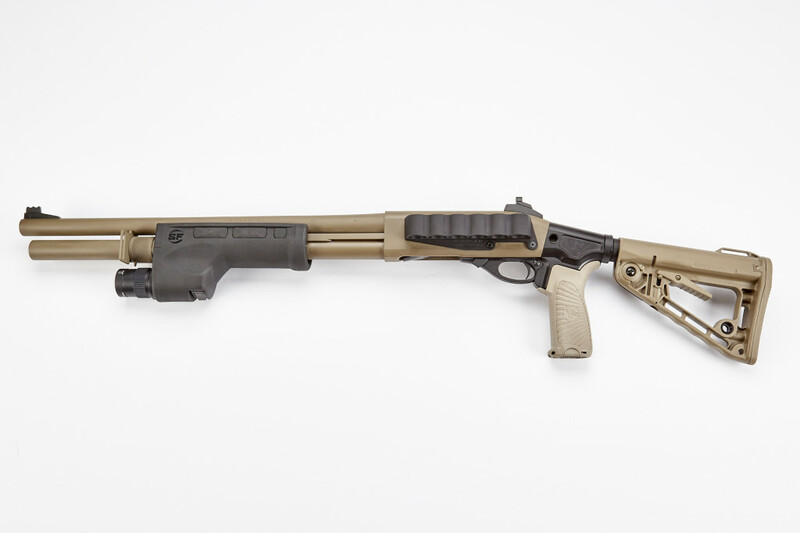 The Wilson Combat CQB Shotgun has been developed at the request of tactical shotgunners looking for the ideal tactical shotgun package with the added adjustability and modularity inherent to a collapsible AR-compatible buttstock. This customized Remington 870 12 gauge has been tuned by our gunsmiths for smooth, flawless function and reliable performance in extreme use. From the low-maintenance Armor-TuffÂ® finish to our the time tested Trak-LockÂ® fiber optic adjustable sights this model is all business-on the range and on the street. The Wilson Combat aluminum collapsible stock adaptor allows the use of an AR-compatible pistol grip and buttstock and is equipped with QD sling sockets to make adding a tactical sling to your shotgun easier than ever before. A host of other custom options ensure that the CQB Shotgun is a top choice for self-defense or duty shotgun use. Weight Empty: 8lbs 9 oz. PLEASE NOTE: It is the purchaserâ€™s responsibility to obtain a transferring FFL dealer to complete this purchase. Please have your dealer fax or email us a copy of their FFL license as soon as your order is placed. FFL's can be emailed to info@wilsoncombat.com or faxed to 870-545-3310. Make sure your name and order confirmation # are clearly indicated in the fax or email to avoid any processing delays.